I’ve been cooking a lot more now that we are getting a little bit more settled in the new digs. It also helps that I’ve been finding so many great recipes online and in books to try. 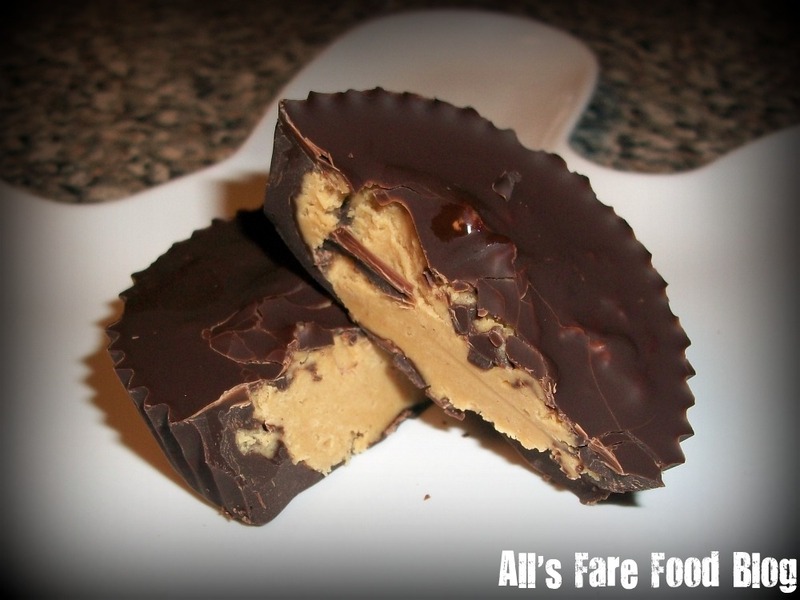 So, when this super simple – almost too simple – recipe for homemade peanut butter cups popped in my Twitter feed (thanks to Alison Sherwood of the Milwaukee Journal Sentinel and her blog “Post-College Kitchen”), I HAD to try it. Seriously, this recipe is SO easy. You need just a few ingredients. No need to bake anything. Just mix it together and chill in the freezer. Within about 30 minutes, you have an awesome dessert or snack! 8 ounces chocolate – I used Ghirardelli dark chocolate chips, but you can use whatever you like – dark, milk, white. Hey, go crazy and use a combo! First, you need to microwave the chocolate (about 10-15 second spurts) until melted. Stir in between to get it nice and smooth. In a bowl, combine the peanut butter and powdered sugar. I used a fork to combine it together. If you’re in a bind, you can omit the sugar, but I guess it tastes like something is missing. Next, line a cupcake tin with paper liners. Drop a little bit of the melted chocolate into the bottom of the liner. Then, drop a tablespoon of the peanut butter mixture. Finally, top with a little bit more melted chocolate to cover the peanut butter. Go cook dinner, read a book or watch some TV and in about 30 minutes you’ll have some awesome, homemade peanut butter cups. The PB cups can be stored in the fridge. Thanks again to “Post-College Kitchen” for giving me this great recipe. This entry was posted in Cuisine - Desserts, Recipes and tagged Alison Sherwood, bloggers, chocolate, easy, Ghirardelli, homemade, Milwaukee Journal Sentinel, peanut butter cups, Post-College Kitchen, recipe, simple by Christina. Bookmark the permalink. Glad you liked it! You’re right – it’s almost too simple!